Though I will post about it later, I've had a life-changing term break, and spent plenty of time with family and friends, and enjoyed amazingly delicious and nutritious foods and weather here in California. It's almost time to head back to Oxford where there is a stronger framework of culture. 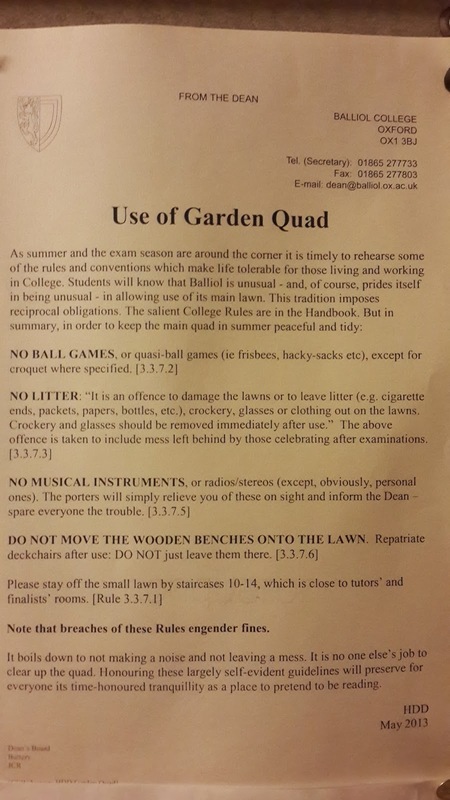 Here are a few from Balliol's posted "Use of Garden Quad" letter. Worth the read - click the image to see it full size. Some of my favorites are highlighted below. "No ball games or quasi-ball games except for croquet where specified"
"No musical instruments or radios. The porters will simply relieve you of these on sight - save everyone the trouble." "Do not move the wooden benches onto the lawn. Repatriate deckchairs after use"
"Honouring these largely self-evident guidelines will preserve for everyone its time-honoured tranquility as a place to pretend to be reading."